Joshua was eight weeks old when I introduced him to Ferdie. I was so nervous that Ferdie might be jealous, but I could not have been more wrong! He fell in love with the puppy right from the start, he was so gentle with him, and they have always been the best of friends. Joshua has always been different. I have never had a puppy so quiet and well behaved. He never did any puppy things, like running off with things so that you will chase him. He has never chewed the furniture, not done any puppy nipping. Always he would let go of things as soon as I asked. He was a dream puppy. He started limping when he was about 18 months old. 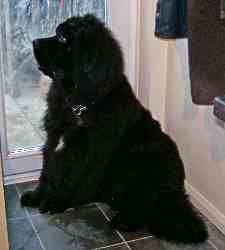 This is not unusual in a giant breed, that they sometimes have growing pains which they do grow out of. But growing pains were ruled out and x-rays were carried out to find that he had early onset arthritis in his wrists. Since then he has had his ups and downs. He is on glucosomine and chondroitin, as well as anti-inflammatories from the vet. I recently learned that it had spread to his elbows. He is just three years old, and is never going to walk far or run and play like a normal puppy. Since he has been having hydrotherapy he is walking like a proper dog and is feeling much better in himself. I know that because for the first time in his life he is trying to steal my dinner! You may think it strange to be pleased that the dog is trying to steal my dinner, but it is so great because it means he feels fine. I had intended to update this page on Joshua's progress with his arthritis. Sadly that will no longer be possible, as I lost my lovely little one on 28th September 2011. Please view my dog memorials page for more information.